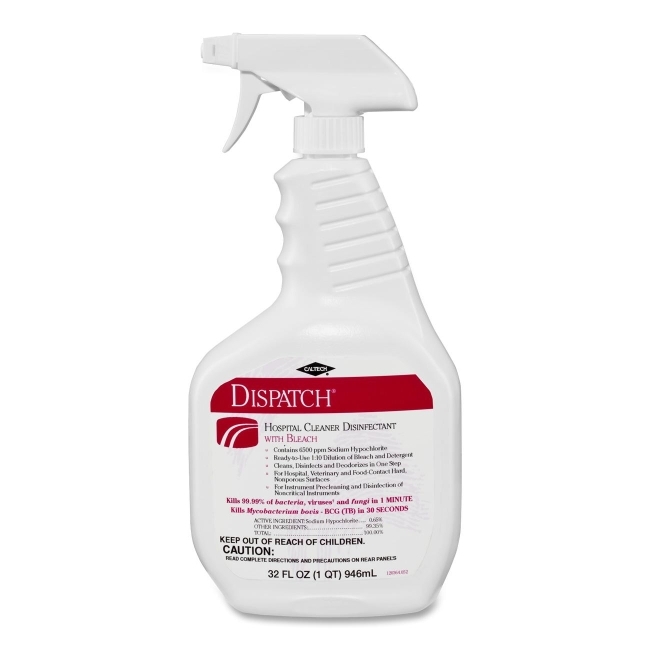 Dispatch Hospital Cleaner Disinfectant with Bleach offers a fast EPA-registered kill time for Clostridium difficile spores and is effective in killing Influenza A. Cleaner/disinfectant kills bacteria, viruses and fungi in one minute and kills TB in 30 seconds at room temperature on hard, nonporous surfaces. 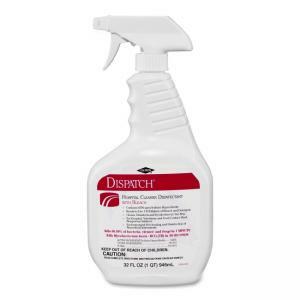 Ready-to-use cleaner/disinfectant in a trigger spray bottle deodorizes, cleans and disinfects environmental surfaces and medical equipment as well as hospital, veterinary and food contact, and hard nonporous surfaces in one step. Unique detergent and bleach dilution strength (6500 ppm NaOCl) is equivalent to the 1:10 bleach solutions recommended by the CDC for disinfecting. Anti-corrosive ingredient minimizes damage to surfaces and equipment. Cleaner/disinfectant meets both Universal and Standard Precautions set forth by OSHA and CDC.